Prepare to ugly cry. William and Shannan of Queer Eye fame, love, luck and fortune just got married. After yet another emotional truth-finding journey into modern masculinity, the Fab Five have done it again. They successfully helped a charming man with zero vanity work up the courage to ask his partner to marry him. 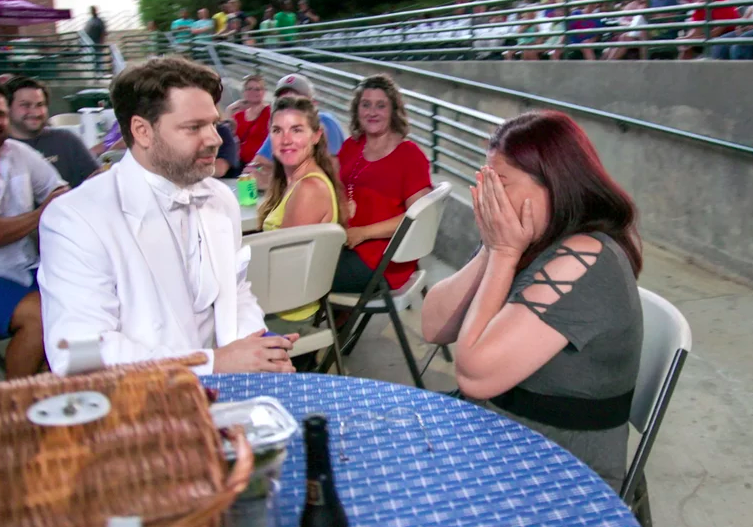 Months after she said yes on Netflix, in the episode titled A Decent Proposal, William and Shannan have finally tied the knot. William and Shannan got married on June 16 in a small, private ceremony on the beaches of Amelia Island at sunrise. Making the announcement informally on Instagram – because he’s living his best life online – William Mankhen told fans the couple’s friend, Deborah Ramey officiated. It was attended by William’s two little girls, Emily and Gabby, who wore matching turquoise dresses, just like their dad and his new wife. Unfortunately, the Fab Five – featuring Jonathan Van Ness, Tan France, Karamo Brown, Bobby Berk, and Antoni Porowski – were unable to attend, most likely for the sake of the couple’s privacy. They were able to congratulate the newly married couple though. Congratulations William and Shannan! Thank you for letting us be a part of your love story and we hope that the next phase of your life is filled with love, movies, and a lot of avocado goddess! We Shannan you both. Congratulations William and Shannan! Thank you for letting us be a part of your love story and we hope that the next phase of your life is filled with love, movies, and a lot of avocado goddess! We Shannan you both ?✨? In case you missed it, Karamo helped William come up with the perfect proposal for die-hard romantic and rom-com aficionado, Shannan. Only, William struggled to put into words how much he cared for his other half, feeling ‘love’ wasn’t enough to encompass the depth of his feeling. So what did he do instead? Made up a new synonymn for the concept of love, specially designed to describe that which he felt for Shannan. Clunky and grammatically incorrect though it may sound written down in black and white by some journalist who ugly cried when she watched the episode, there was, in fact, a whole bit. It was cute, take my word for it. Or watch it yourself on Netflix. Elsewhere, Tan taught William about the French tuck, Jonathan helped him out with his hair and grooming routine, Toni taught him how to make avocado-based treats and Bobby gave the couple’s pad a new lease of life. This isn’t the first time the Fab Five’s intervention has lead to a couple tying the knot. In season one, they helped Tom Jackson rekindle his romance with ex-wife Abby Parr, and the reunited lovebirds tied the knot when they married in March in Gatlinburg, Tennessee. Fellow season one subject AJ Brown also married his boyfriend, Andrey, and revealed their matrimonial bliss during a Netflix event. We Shannan the Fab Five! Keep up the good work guys. Both seasons of Queer Eye are currently streaming on Netflix.